Joanasie Manning is a third generation carver who was born on June 6th, 1967 in Kinngait (Cape Dorset), Nunavut. He has a large family of parents, siblings, half brothers and sisters as well as adopted siblings. His biological father is Tommy Manning and his mother, Annie (Pitseolak) Manning is an accomplished seamstress of traditional Inuit clothing. His great grandfather Ohotak Ipeelee was one of the first carvers around Kinngait carving ivory. Ivory was a traditional medium for carving tools and amulets. The decorative objects were often worn as necklaces or sewn into clothing for protection. These earlier ivory pieces were decorated with scrimshaw, a form of incising lines into the ivory and filling in with soot to make designs. Ohotak shared his skills with his son, Osuitok Ipeelee, RCA showing him how to carve at an early age before the co-op art development arrived in Cape Dorset. In later years, Ohotak was also involved in drawing as was Osuitok. Master carver Osuitok Ipeelee (1923-2005) is Joanasie’s grandfather and he used to watch Osuitok carve and received a lot of his carving knowledge from him. Osuitok would tell him how to cut the stone to make something. He gave instructions to Joanasie on how to chip stone using an axe and how to saw, file and finish carvings. He admired the details Osuitok had on his carvings. Joanasie would help his grandfather file and sand his work. Growing up, Joanasie would be out on the land with his parents in nomadic spring and summer camps. When his grandfather, Osuitok built a cabin at Ittliarjuk, Joanasie would sometimes stay out there with him during the winters. Joanasie’s first carving was a bird at the age of 9 which he sold to the co-op for $2.00. He worked for four years as a municipal service worker before he began carving full time in 1986-87. Joanasie has a big family of his own with his partner, Mary (Qiatsuq) Manning, granddaughter of Lukta Qiatsuq. Three of his son’s carve: Abraham Manning is a carver of mainly bears, Sam Qiatsuq, carves mainly owls and Mickey Qiatsuq, who now carves much less. Joanasie’s family members when available will help file and sand his pieces. Joanasie has taken the knowledge gained from his grandfather’s generous skills and his beautiful surroundings to create his own signature style. He has previously carved figures of hunters and fisherwomen with perfectly detailed harpoons of wood and antler for the hunter and kakivak (a fish spear) for the fisherwomen. Joanasie has enjoyed sculpting caribou in the past. He has also been inspired by the work of respected elders Lukta Qiatsuq and Kiugak Ashoona, OC, RCA, for the details they put into their carvings. In the last ten years Joanasie’s artistic focus has been mainly owls. He enjoys making the Arctic owl in his own unique style that developed over the years. Joanasie is respected for his precise caribou antler eyes inlayed with dark stone or ash inlay. He used to use baleen for the pupils but because baleen is not allowed for export, he no longer uses it. Caribou antlers are more scarce now with the dwindling caribou herds in the baffin region and can present challenges when sourcing material. Joanasie’s owls often with mother and chick, sometimes more than one, are full of dignified beauty. He is well known for his owls with tenacious wings, a variety of positions and the birds faces are full of expression. Many of Joanasie’s sculptures have protective wings showing the strong bond of family. The detailed wings of the owls can become the main focus of his pieces. He spends a lot of time sculpting the signature feathers that add to the carvings three dimensional presentation. The wonderful movements his owls have and the curious expressions draw the observer in. Joanasie’s owl faces have what look like eyebrows that may be the subtle feather tufts Arctic owls have on their heads. Joanasie sees snowy owls when he is out on the land and he is in awe of their elegance. His main goal when carving owls is to depict the beauty of these majestic birds. Like many other artists he is influenced by the shape of the stone that he is sculpting. The tools he uses are the grinder, die grinder, dremel, files, chisels and sandpaper. He carves both serpentine and marble stone and prefers softer serpentine stone as it is easier to work with. Joanasie often signs his carvings in English as it is more understandable by the buyers. Once in a while, he signs his name in Inuktitut. Joanasie prefers a high polish shine for his carvings and with marble stone he will use a slightly less high polish. 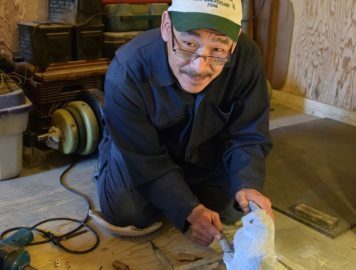 Joanasie has lived his whole life in and around Cape Dorset. He has gone out many years when he had his own boat to mine stone. He has noticed a recent change in the stone from one of the mine sites. This stone has more quartz in it which makes it more difficult and challenging to carve as it is hard in contrast to serpentine which is more easily carved, filed and sanded. Joanasie continues to go out on the land, though in the past few years he has not had his boat or a snow machine to do this as often. He enjoys going out on the land to get country food, which is preferred food by his family. Now he will go out with other hunters. His favourite animal is the polar bear because it is powerful, intelligent and a good hunter. Humans need to be alert around bears. Joanasie has had over thirty years working in the art form. His style has influenced the next generation of artists including his son Mickey Qiatsuq, Adamie Qaumagiaq, and Adamie Mathewsie. Joanasie’s carvings have been included in gallery exhibitions in both Canada and the U.S.A.. Joanasie’s style has evolved into strong and commanding sculptures with precise focus on the design and form.